Samsung's heavily fragmented smartphone range continues to expand in all directions at once, in this case with the Samsung Galaxy Ace 2. 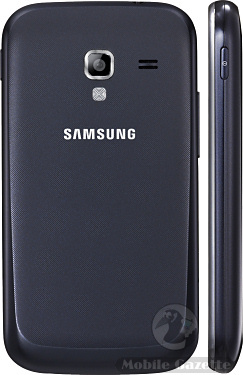 The original Galaxy Ace was pitched at the lower end of the midrange market, presumably where the Galaxy Ace 2 also finds itself.. although the Ace was only upgraded last month with the Galaxy Ace Plus which presumably will be sold alongside the Ace 2. We've given up trying to make sense of Samsung's naming convention, and the proliferation of Galaxy handsets is confusing and there are frankly too many to choose from. There's a fine line between having a good range and having a range that baffles consumers. The Galaxy Ace 2 is designed to appeal to people who want a relatively high resolution screen but don't need the fastest phone on the market. To this end it has a 3.8" 480 x 800 pixel TFT display coupled with a dual-core 800MHz CPU with a very reasonable 768MB of RAM. Usually dual-core processors are limited to high-end devices, and they give a speed boost of about 20%.. so the Galaxy Ace 2 is roughly as powerful as a 1GHz single-core CPU. Internal flash memory is a useful 4GB, and there is also a microSD slot. On the back is a 5 megapixel camera with 720p HD video capture, on the front is a VGA resolution camera for video calling. In addition to the media player, the Galaxy Ace 2 has an FM radio and a 3.5mm audio socket. All the usual features are here including 3.5G support, WiFi, Bluetooth, USB connectivity and GPS (in this case supplemented with the Russian GLONASS positioning system). The operating system is Android 2.3 plus some of the usual Samsung enhancements. There is no mention of an Android 4.0 "Ice Cream Sandwich" upgrade though, so users may be stuck with Gingerbread instead. Inside is a relatively large 1500 mAh battery, and the whole device measures 118 x 62 x 10.5mm and weighs 122 grams. The Samsung Galaxy Ace 2 will find itself competing with the Motorola MOTOLUXE, another device aimed at users who want a bigger screen rather than more processing power. 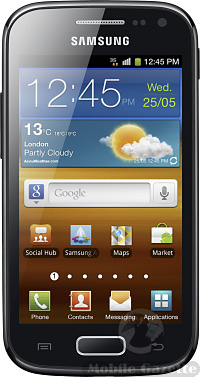 Samsung say that the Galaxy Ace 2 should be available in the UK from April with other regions to follow afterwards.